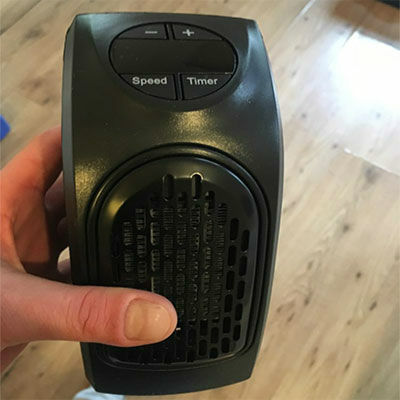 Heatbuddy is a compact space heater that heats any room in your home without taking up too much space and without significantly increasing your energy bill. It’s small enough to take to the office or on the road. 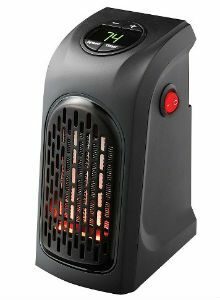 This black heater with its digital temperature display connects to any electrical outlet and circulates heat through an entire room up to 250 square feet (23 square meters). With only a few inches wide, this heater is almost imperceptible regardless of where you put it. Due to its thermo-ceramic design, Heatbuddy circulates heat in a powerful way through its two-speed fan, despite its small size. After adjusting the desired temperature through its thermostat, the appliance will ensure that the heat circulates throughout its environment, making it warm and cozy. If you want to maintain an environment warm while you are not there, you also have the option to set the automatic timer so that your device automatically turns on at a certain time. Digital Display: on top side of the heater, so you can easily identify the temperature of your room. Simple On / Off Process: Although you can set a timer for your heater to automatically turn on, you can also turn it on and off manually by switching the red button located on the right side. Stay cool to the touch: You do not have to worry about burning your fingers if you accidentally touch the heater because it is always cool to the touch. Portable: If you are going somewhere cold, you will have no problem bringing the Heatbuddy with you as it is small enough to fit in a backpack. In addition to using it in a hotel room or someone else’s home, you can also use it in a trailer or in a camp with electricity. Even if you are going to the office, you may want to carry it if you tend to feel cold at your desk. Ideal for dorms: Since dormitories are usually smaller than 23 square meters, this heater will likely be able to provide heat to the entire room without major problems. It can be annoying to get out of the shower and step on a cold bathroom floor. Fortunately, making use of this heater warms up your bathroom with extra heat so that stepping on the cold floor is not a problem. With the heater on, your hair can even dry faster than it usually dries! Useful in Working Rooms: If you tend to spend a lot of time in a room working on projects, connecting Heatbuddy will make the environment comfortable and enjoyable for you. Also, if you like to work on projects in your garage, you can use one of these to heat that area as well. The Heatbuddy is a compact personal heater that plugs into any common outlet. This device features a digital display screen, on/off timer, two different fan speed settings and provides up to 350 watts of heating energy. Heatbuddy is much more compact than conventional heaters and does not take up space on the floor. It heats up to 23 square meters of space and is portable. This makes it great for home, small office or travel. The heater also has a thermo-ceramic design that keeps it cool to the touch.